To see some of my photographs click on the image below. This will take you to my Picasa/Google album. 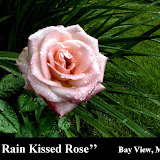 Then again click on the Rose image to start a slide show of larger images. I specialize in panoramic photography. Via meticulous pre-shoot preparation, a moderate telephoto lens and a robotic camera mount, I can create panoramic photographs that very literally are not otherwise possible. For example, my “Taughannock Perspective” was created by stitching together 135 images. Attempting a similar result by using an extreme wide angle lens would have resulted in major distortions. I make premium quality, true archival, fine art prints; mine or yours – acid, lignin, and chlorine free with independent Wilhelm display life ratings of 34 to 100 years. I use my Epson Stylus PRO7600 Ultrachrome Printer to produce prints 24 inches wide; any length. I print on canvas or fine art papers by Epson, Arches, Crane, Somerset, etc. This printer is the same one the Boston Museum of Fine Art has used to make reproductions to sell in their gift shop – it makes truly exceptional prints; fantastic for either fine art or a cherished family photo.